The book ‘The Framework of Nagarjuna’s philosophy’ is an attempt to reconstruct a better understanding of Nagarjuna’s philosophy in a novel way. It is a new and somewhat unconventional way of looking at Nagarjuna’s philosophy. The work is carried out by strictly adhering to original Sanskrit text-Madhyamaka Sastra. The author has dealt with three important concepts viz. Pratitya Samutpada, Sunyat and Nirvana which are considered to be highly technical, philosophically rich and intellectually rewarding as pillars of Nagarajuna’s philosophical position viz. Madhyama Pratipad. By analysing these three concepts, the author shows that intricate line of Nagarjuna’s reasoning is woven around them. The author further shows that the teaching of the Buddha and thereby path between two extreme positions adopted in this regard on any level of understanding. It is the contention of the author that the meaning of Madhyama marga can be understood only by proper understanding interrelation, between Pratitya Samutpada, Sunyata and Nirvana as distinct from its simplistic interpretation in vogue. This book, it is hoped, will be a good contribution to the field of Indian philosophy in general and classical Buddhist philosophy in particular. The author of this book, Dr. A.M. Padhye has a good academic career. Graduated in 1972 from the Poona University, Dr. Padhye obtained his post-graduation University in first class from the same University in 1974. Since then, he is working as a lecturer in the Department of Philosophy at Sonopant Dandekar College, Palghar, Dist. Thane, (Maharashtra). Dr. Padhye prosecuted his higher studies and completed Doctoral of Dr. M.P. Marathe, an eminent scholar of the subject. He was awarded Teacher Fellowship by University Grants Commission. Dr. Padhye has contributed some articles in Marathi on philosophical subject to some reputed periodicals. (1) On the one hand one’s aim may be to understand and comprehend not only the classical thought along with its prominent implications—philosophical, methodological or otherwise—but also to study and articulate the conceptual framework that may be in its background. (2) On the other hand, one’s aim may be to study contemporary relevance and significance, if any, of the classical thought under consideration. These two aims may not be necessarily be sought to be accomplished in isolation from each other. They might be sought to be accomplished together. But two things in this connection should be borne in mind carefully a) The second aim cannot be significantly accomplished unless considerable amount of clarity in comprehension and understanding emerges on the count of the first aim. Despite this, it is often noticed that scholars venture to accomplish the second aim without requisite clarity on the side of the accomplishment of the first aim. As a result, such efforts turn out often to be both abortive and non-illuminating. Something of this kind happens to be the case not out of an accident. It is often forgotten—also not properly understood—that it is in vain to try to accomplish the second aim without accomplishing the first. Otherwise, one might try to study relevance of certain classical thought without bothering to comprehend what precisely that thought is, of which one is studying such relevance. b) The first aim alone may be expected to be accomplished in isolation from the second. This may be done for the sake of the convenience of keeping the study that is undertaken within a manageable limit. On the contrary, the contemporary significance of a given classical thought may not be traced for the very simple reason that it has not been discovered at all or perhaps because it is troublesome to state it in the contemporary intellectual atmosphere. What is important, however, to understand is that, the first of the two above mentioned aims may be sought to be accomplished in isolation from the other, and in doing so, the sort of study under consideration may not involve a serious kind of shortcoming. It cannot nonetheless, be said that a given classical thought has no contemporary significance and relevance at all. For, subscription to this view brings in a very serious kind of lacuna in the classical thought under consideration in so far as a classical thought that lacks any contemporary significance whatever does not remain classically so important, whatever other significance it may have. This being the case, a study of the contemporary significance of a classical thought of a certain kind cannot be avoided on the ground that it has none. The present study hopes to accomplish the first of the two above mentioned aims with reference to Nagarjuna’s philosophy. It may, however, be asked in so far as many scholars—both Indian and western—have already undertaken to study and articulate the philosophy of Nagarjuna understanding its classical relevance and significance, where is the need for one more Study of the kind that we propose to undertake? Given that muffler of articles are written op Nagarjuna’s philosophy that it is presented in its historical setting and also given that some of its tenets have been comparatively tried to be understood, is not the sort of study that we want to undertake unnecessary and therefore dispensable? Just on the ground, the objection continues that Nagarjuna’s philosophical thought is classically important one need not be the basis of proliferating intellectual world with its studies which bring in and state the same significance of it. For, such an exercise may turn out to be, other things remaining the same, a non-content increasing one. Under such circumstances we would be better advised not to undertake the sort of study that we wish to. The objection under consideration, however, would have been respectable bad the situation been as it holds or even expects it to be. But, unfortunately, the prevalent situation is different. In spite of the fact that many scholars have attempted to study the nature and significance of Nagarjuna’s philosophical thought, the efforts under consideration have given rise to considerable difference of opinion and such a mass of variety of views about his philosophy has given rise to confusion and misunderstandings. As a result, it has become exceedingly difficult to see what precisely is his philosophical position. The matter has become worse confounded especially in so far as that sort of philosophical position that has been attributed to him is at variance from the one he, as a matter of fact, wishes to upheld and defend. Furthermore, very often than not a certain doctrine, a certain methodological or even, a certain perspective itself has come, unfortunately, to be equated with his philosophical position. Moreover, a doctrine has come to be studied in isolation from the methodological tool—say, Pratitya Samutpada—is studied in isolation from Sunyata or conversely or, methodological tool has been studied in isolation from the perspective—say, .Sunyata—has been studied in isolation from Nirvana or, further still, his philosophical position— Madhyma Pratipad —either nowhere finds its mention or is mentioned in isolation from Pratitya Samutpada, Sunyata or Nirvana. These are some of the prominent shortcomings of the extant studies in the philosophy of Nagarjuna, though, by no means, are these the only shortcomings one can think of. Under such catcalls Canoes, interrelation between and among Pratitya gamtupada, Sanyata. 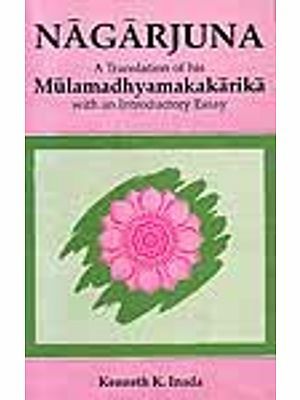 Nirvana’ and Madhyama Pratipad is either not at all articulated or where it is attempted to be articulated, it is far from being satisfactory- As a result, the basic conceptual framework of Nagarjuna’s philosophy has not at all been articulated or where an attempt in this direction has been made, it has remained ambiguous and fraught with many inadequacies. This being the case, it has become enormously difficult to comprehend and understand the philosophy of Nagarjuna, leave alone understanding its relevance and significance— contemporary or otherwise. Given this kind ‘of situation prevalent in our intellectual atmosphere, the task of understanding Nagarjuna’s link with the teaching of the Buddha, though they were severed from each other by couple of centuries, has remained far from being clearly accomplished. It is this kind of situation, therefore, that prompted us to undertake the sort of study that we wish to with a view to formulate and articulate framework of Nagarjuna’s philosophy, leaving to future consideration the issue of studying its contemporary significance. This kind of limitatation is brought in due to the fear of work becoming difficult to complete in certain time span. We grant, however, that an investigation on this line is also equally important and urgently called for. We said that our aim is to articulate the framework of Nagarjuna’s philosophy through studying interrelationship between Pratitya Samutpada, Sunyata, Nirvana and Madhyama Pratipad. The last of these being Nagarjuna’s philosophical position the task that needs to be undertaken is to show that his philosophical position arises out of the interrelationship of the first three with Madhyama Pratipad. In order to do this one must have to develop an understanding about Nagarjuna’s works. Of the number of works that are ascribed to Nagarjuna not all, unfortunately, are available in Sanskrit. Normally one has to rely upon those that are extant and fortunately available and among those which are available one has further to utilize those which are useful for the purpose at hand. Considering this way, of those works of Nagarjuna which are available in Sanskrit, two stand out very prominently, viz. Madhyamakasastra and Vigrahavyavartani. But from the point of view of an elaborate statement of the philosophical view of Nagarjuna it is the former of them that is crucially important. This is not in any way to undermine or belittle the importance of other works. But the fact remains that anybody who wants to understand some of the principal tenets of Nagarjuna’s philosophy in a considerable details cannot afford to ignore the work under consideration. We have made an extensive use of Madhyamakasastra. We have, of course, given priority to Nagarjuna’s contention in the work under reference and have taken help from C3ndrakirti, his commentator, wherever this kind of need arose. Other work of Nagarjuna like Vigrahavyavartani, Ratnavali have also been relied upon wherever and to whatever extent it was possible and desirable to do so. The major point of concentration is, however, Madhyamakasastra. Here as well as in case of other works of Nagarjuna we have relied upon the original works in Sanskrta rather than their translations and summaries. We have, thus, tried to remain as close to the original works of Nagarjuna as was possible and desirable. In the first chapter we present an outline of the principal interpretations of Nagarjuna’s philosophy at the hands of various scholars and bring out some of the crucial difficulties they appear to give rise to. Second chapter is addressed to formulation of the theory of Pratitya Samutpada as Nagarjuna understands it, wherein it is argued that it presents Nagarjuna’s world view, according to which discrete particular unique things alone are real and the only thing that is true of them is that they are connected though not necessarily causally. The third chapter discusses the nature of Sunyata as a methodological tool employed by Nagarjuna to arrive at a sort of nominalism and to weed out proliferative ontological, epistemological and linguistic abberations on our part. It is argued that employment of Sunyata at Nagarjuna’s hands does not and cannot give rise to nihilism. In the fourth chapter we explain the nature of Nirvana as a philosophical perspective which, according to Nagarjuna, needs to be adopted with a view to arrive at a philosophical position called Madhyama Pratipad. It is further argued that Pratitya Samutpada Sunyata and Nirvana, at the hands of Nagarjuna are very intimately interrelated and to the extent to which one fails to understand the kind of interrelationship between them one is not likely to understand Nagarjuna’s philosophical position as he intends it to be taken. It is further pointed out that Nirvana needs to be understood not so much as a summum bonum or bliss or an ethical or religious ideal to be accomplished but rather as a philosophical perspective and it is only when it is understood that way it can be taken to be a prominent pillar sustaining Nagarjuna’s philosophical position. It is further argued that thus understood alone it at once establishes connection with Pratityasamutpada and Sunyata on the one hand and Madhyama Pratipad on the other. It is also pointed out that although Nirvana as a philasophical perspective has ethical religious of social implications it is not, nevertheless, these which shape and structure it. In the last chapter we argue that Nagarjuna’s philosophical position is not Sunyavada as it is often alleged but Madhyama Pratipad and as a middle path it seeks to strike a via-media between nihilism and realism – the view according to which everything – real or imaginary – is real, or between eternalism and utter momentariness etc. Understanding Nagarjuna’s philosophical position in this way alone enables us to see its connection with Buddha’s teaching, which otherwise remains vague and obscure, on the one hand, and with Pratitya Samutpada Sunyata and Nirvana on the other.